This Hot Reuben Dip is warm and creamy and melty with Swiss cheese, chopped corn beef, mayonnaise, Dijon mustard and sauerkraut. 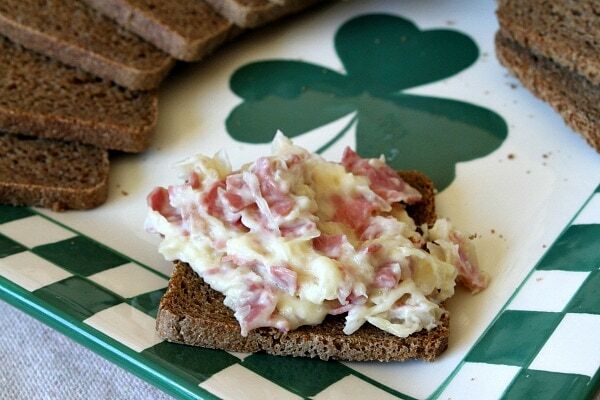 Served with cocktail bread, this easy Rueben Dip recipe is a fun happy hour treat for St. Patrick’s Day or any happy day. Have you ever had a Reuben Sandwich … warm, cheesy corned beef and sauerkraut stuffed between two slices of rye bread and slathered with Thousand Island dressing? My husband orders a Reuben every time he spots one on the menu. I happen to love them too, but they’re definitely a decadent, once-in-a-while splurge. Well, this is my dip version of the Reuben sandwich (without the dressing): Hot Reuben Dip. It happens to be be an easy Reuben Dip to make. It’s creamy and warm, and it’s delicious served with little pieces of Rye or Pumpernickel cocktail bread or sturdy crackers. 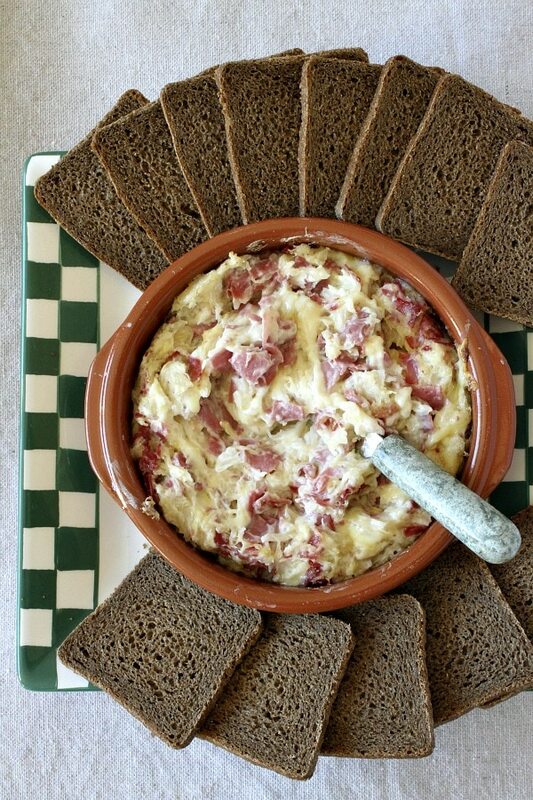 I serve this hot Rueben Dip with pumpernickel cocktail bread when I’m serving it at a party. My family will tell you that they actually prefer to eat it with Ritz crackers! This dip makes a small amount- enough for about 8 generous servings. 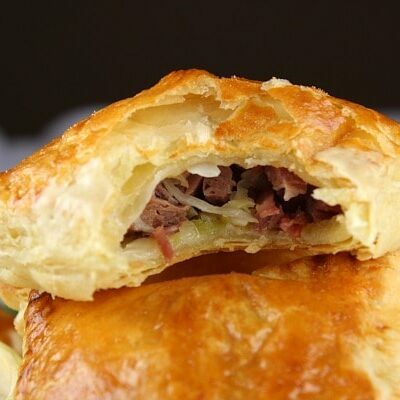 If you’re wanting to serve it for St. Patrick’s Day (or another party day) for more than a handful of guests, you might consider doubling the recipe. 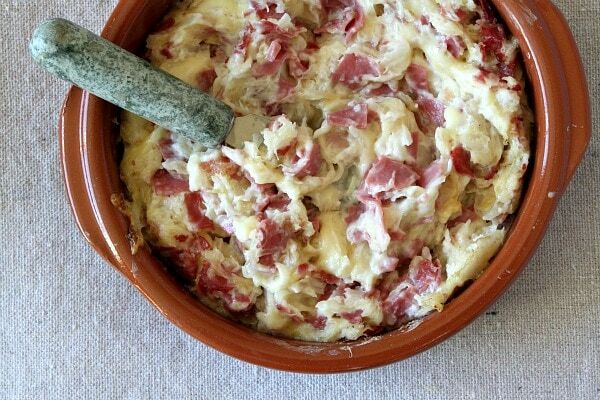 People love this easy Reuben dip. It’s so warm and cheesy and comforting! It looks pretty delicious, doesn’t it? Maybe you’d like to take a bite or six? I agree. Add a glass of chilled white wine, and I’ve been known to call this “dinner” once in a while! P.S. 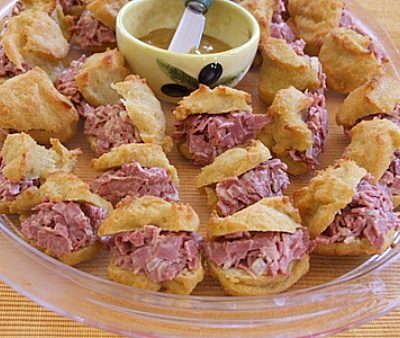 You can plan to use leftover corned beef for this recipe (like that ever happens!?! )… or you can also use sliced corned beef from the deli. And if you still think you’d really like to add some Thousand Island dressing, it’s perfectly okay to drizzle some on top of the dip (or on individual bites). Super easy and delicious dip that is perfect for parties! Combine all ingredients in a medium bowl, stirring well. Spread into a medium, oven-safe dish (or an 8x5-inch loaf pan will work in a pinch). Bake for 30 minutes, or until hot and bubbly. Serve immediately. For a true Reuben vibe, drizzle Thousand Island dressing on top of the dip (or on individual bites). I was wondering if this could be made a day ahead of time and kept in the refrigerator until time to bake it? That will probably be fine. I made this recipe yesterday for the first time. I was taking it to a party, so I doubled the recipe. It was the hit of the party!! Not a nibble left over. People were asking for the recipe; many saying they could eat this dip for breakfast, lunch and dinner – then for a snack later! 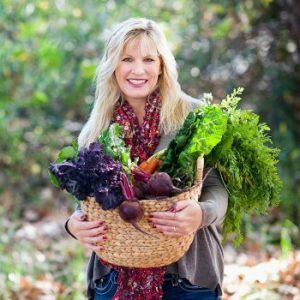 Thanks for sharing a wonderful recipe with us, Lori. SO glad it was such a big hit! Any way this can be made in a crock pot? Or cooked, chilled and then put in a crock pot for a work potluck? I haven’t tried this recipe in a slow cooker. 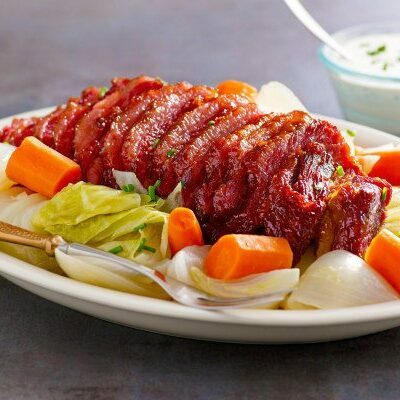 I think im gonna try this but switch the sour kraut for coleslaw. Sorry- I did not see this before Mother’s Day! Hope it worked out! So good! I originally picked this recipe for a party knowing a friend would like it, but at the time I personally had zero interest. However, I ended up eating this almost exclusively the night of the party. Very easy to make and extremely tasty! Made this over the weekend Lori….and it was awesome! Next time I’m spreading this on a sandwich and grilling it! I love dip dinners–this looks delicious! I made this today and it’s amazing! This is coming from Nebraska . . . did you know The Reuben originated at a hotel in Omaha? The things we do with beef around here! Thanks for the amazing dip. I think I’ll serve it even when it’s not St. Patty’s Day. Love this recipe. I just added it to my St patty’s Day lineup. Yeah, I better double the recipe, My Hubs is a Reuben fanatic! He will LOVE this! Oh my gosh, yum!! Your dip looks amazing!!!!!!!!!!!!! Pretty sure I just said OMG 100 times while looking at this dip. 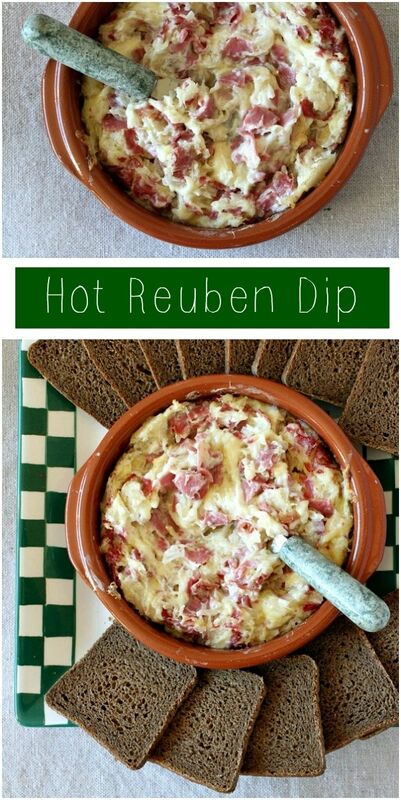 Reubens are probably one of my favorite things on this earth and this dip looks so good I can’t wait to try it! Definitely try the refrigerated sauerkraut! I agree! If you use the refrigerated stuff, just squeeze it dry and use about 1 cup (packed).